Ask fellow campers about "Guaranty RV Park" and nearby attractions. 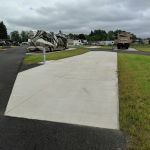 A new-ish RV park in Junction City, Oregon on hwy 99 that is off to a great start. One of the best things about this RV Park is the way it is laid out. The middle pull through sites are all angled and long enough so that you are not staring into your neighbors window of at their sewer hose. You park on a level concrete pad with lush green grass on either side. The roads are wide and easy to navigate. The wifi was excellent although there were on about half a dozen guests at the park. 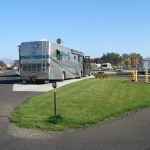 This park is located within the Guaranty RV Super Center which has everything you need for your RV. The restaurant within the complex closes at 4:00 so we never got a chance to sample it. Maybe it will stay open longer in the busier season. All the hook ups are located at the rear of the site. There is a nice fenced-in dog park comprised of gravel/small stones - much better than grass. The only minor knock is that they should have hedges bordering the park so you don't see the surrounding traffic and vacant lots. If you're passing thru highly recommended. We camped at Guaranty RV Park in a Fifth Wheel. Recent previous reviews are accurate. Picnic tables at all sites. Entry signage of highway 99 is poor - it's clearly an RV dealer but no entrance is designated specifically for the RV park. At my back-in site the sewer connection was at rear and water/electricity in middle of paved site, with well cared for grass surrounding the concrete. Water spigot had back-flow preventer installed, with an odd protruding center pin that penetrated into the gasket screen of my pressure regulator, bunging it up. Wifi was very good - video capable - and OTA TV included the 4 major networks. 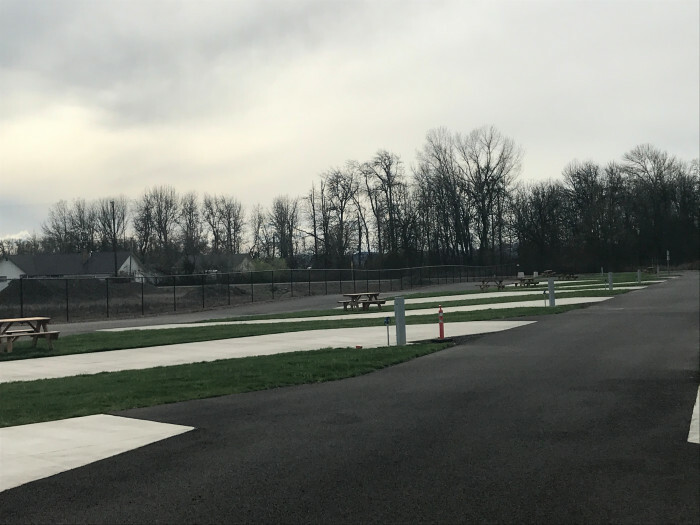 This was the only park near Eugene with last-minute spaces available on the weekend the Ducks played Stanford. Guaranty employs a private security vehicle which made frequent nightly rounds through the park and adjacent dealer/service grounds. We camped at Guaranty RV Park in a Fifth Wheel. Safeway just up highway 99 in Junction City, with a good price on diesel fuel. Very nice newer park. Only been open for about 8 months. Finally someone built a NEW park. Guaranty is a huge RV dealership with the park setting behind the sales lot. Not a park you can see from the road unless you know it's there. Pull-up in front of store and register inside. They will direct you or lead you to your site. Excellent store with just about anything you want-or need. Pads are concrete with grass all around. Most sites are pull-throughs with a few back-ins. We camped at Guaranty RV Park in a Motorhome. Owned by the local dealer (Guaranty RV), and is behind their sales and service facilities. 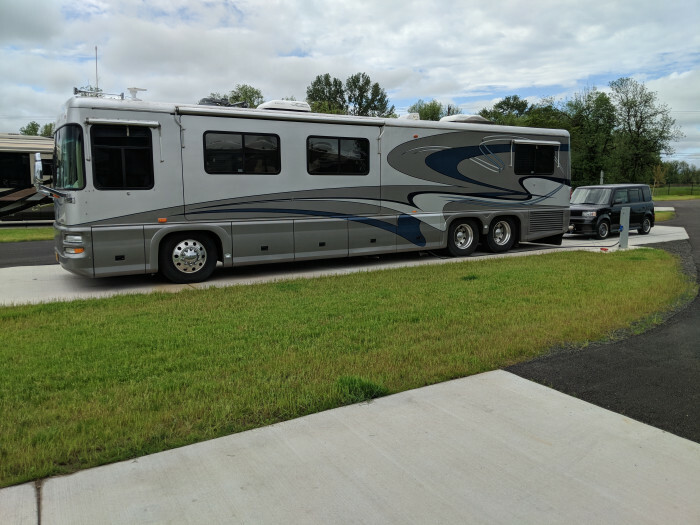 We stayed 4 nights after we picked up our new motorhome. Made reservations by phone. There were multiple check in parking lanes but most were full with delivery units or service units, it seemed. Roads are paved. Mixture of back-ins and pull sites with most able to handle attached toads. Full hook ups - water, electricity (50/30/20 AMP), & sewer. Picnic tables not set out yet on all sites, but I imagine you could go get one (near the front restrooms where they had them stacked). Quiet for us, but we're well insulated. Auto search for OTA TV found plenty of channels, include all major networks. Pet area next to the central restrooms. RV Store and restaurant on-site, but limited weekday hours. RV park just opened this last Winter, so it is not generally known about yet. Not too many campers, even on a weekend. Can hold 55, and there were maybe 20 spots taken for the weekend. Mostly used for motorhomes passing through or there for service or pickup from the dealer. We camped at Guaranty RV Park in a Motorhome. Close to the town of Junction City, but a bit of a walk along a State Highway. We do not recommend walking, simply because of the traffic. The town has lots of restaurants, some shopping. Typical smaller town. Very Nice! The utilities as noted are at the rear of the pads, so with that in mind you must park the RV at the rear/entrance to the concrete in order for the hookups to reach and unhook & then park your "toad" in front of the coach.. bit odd as most Class A's have their sewer bay 2/3rds back along the coach not at the rear Really nice little cafe in the reception/RV Parts bldg. (Good Biscuits and sausage gravy..I think they call it a "redneck" something or other) NOTE! 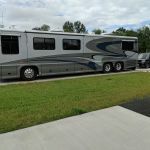 There is a 10 year RV age rule, but that can be waived if your coach is presentable. 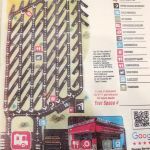 We camped at Guaranty RV Park in a Motorhome. 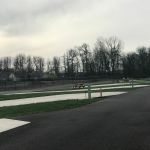 Fairly new RV park, on site with RV dealership, service center, RV store, & cafe. Sites are concrete, interior roads paved, nicely maintained grass between sites. Contrary to the previous rating, I saw no evidence of leveling issues here, our pull through site was level. Also contrary to the previous rating, the interior roads were not difficult to navigate, we were in a 40' MH. Full hook ups but they are located at the rear of the site, needed 3 sewer hose sections to reach. Bathroom on site had no shower facilities. Good central location to exploring the Eugene area. We camped at Guaranty RV Park in a Motorhome. We stayed 1 night waiting for an RV appointment in the morning. Made reservations by phone due to $5.00 fee for on line. The staff never provided any of the information that had been promised. The park access is off a 4 lane highway (HWY 99). Check in is in the Travel Center. There were multiple check in parking lanes but only 1 was available as the others were full. We arrived on a holiday so it was closed. Our site assignment was posted on the after hours check in board but nothing else. 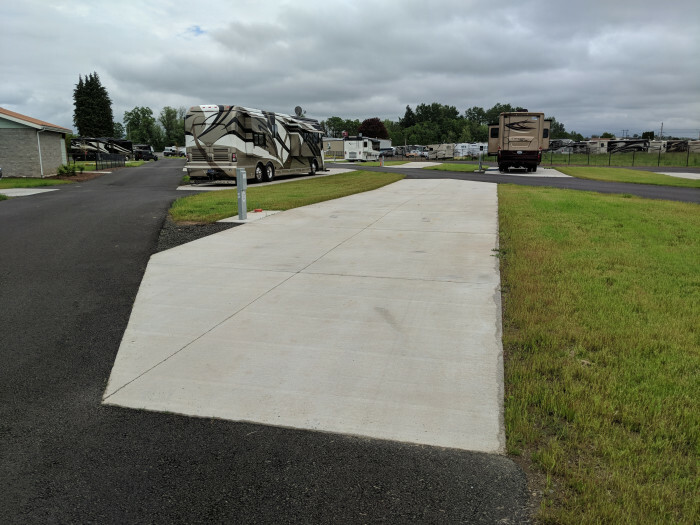 Access to & from the park requires negotiating the parking lot of the T/C and the adjacent RV sales/maintenance lot with several sharp 90 degree turns. The interior roads are paved. They are sufficient width making maneuvering larger RV's pretty easy but there pitched to direct water run-off into drains. There is a mixture of back-ins and pull sites. A few of P/T sites were long enough to say connected to a toad but the placement of the utilities made it difficult to stay connected. The RV sites have sufficient width to open slides. The space between sites is sufficient. The parking pads are concrete. This park didn't seem to understand the simple concept of the importance of a flat, level site as almost all of the sites have a bi-directional slope. Only a handful of the back in sites appeared generally level and flat. They have full hook ups - water, electricity (50/30/20 AMP), & sewer. The utility connections were towards the end of the sites creating sewer flow and hose/cable length issues. The sewer connection was above ground making it difficult to establish a downhill flow depending on discharge point. Sites didn't have an outside table or no fire pits. There were tables staged for when the weather is better suited to sit outside. Site orientation doesn't allow RV's to cast shade onto the patio side. There was some train & plane noise. No satellite obstructions or cable. Limited OTA channels. Only 2 major networks. We camped at Guaranty RV Park in a Motorhome. Arrive during office hours to receive WiFi password and other important information. 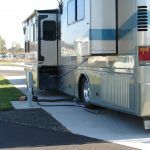 Are you affiliated with Guaranty RV Park ?